This is the time of year when thoughts always turn to spring cleaning and sprucing up any part of your home that looks tired, out of style or just worn out. Since May also happens to be National Home Improvement Month, we’d love to offer some “before & after” inspiration to jump start your thinking about the great things you can do to improve your home! We think that this award-winning exterior remodeling project by Merrill Contracting and architect Matthew Guenther is a perfect example of the amazing transformation that we can accomplish. The run-down “before” exterior of this 1970s home in Arlington, VA was transformed so dramatically, you almost wouldn’t believe the “after” is the same house! BEFORE: The house was clad in vertical plywood siding that looked drab and dated. AFTER: The old siding was replaced with new fiber cement HardiePlank lap siding and HardiePlank panels, making the exterior both attractive and environmentally friendly. BEFORE: A combination shed and carport were an unsightly and unwelcoming entrance to the house. The actual front door was not even visible from the street. AFTER: The carport was replaced by an oversized one-car garage. Opaque glass garage-door windows framed in metal give the home a fresh, modern feel. The new front entry is now front and center, connected by a welcoming covered porch to the driveway and garage. BEFORE: A tired, unused balcony added nothing to the overall look of the home. AFTER: The roofline was extended from the garage to create an overhang and an L-shaped porch lined with pillars. This completes the transformation of the home’s appearance. 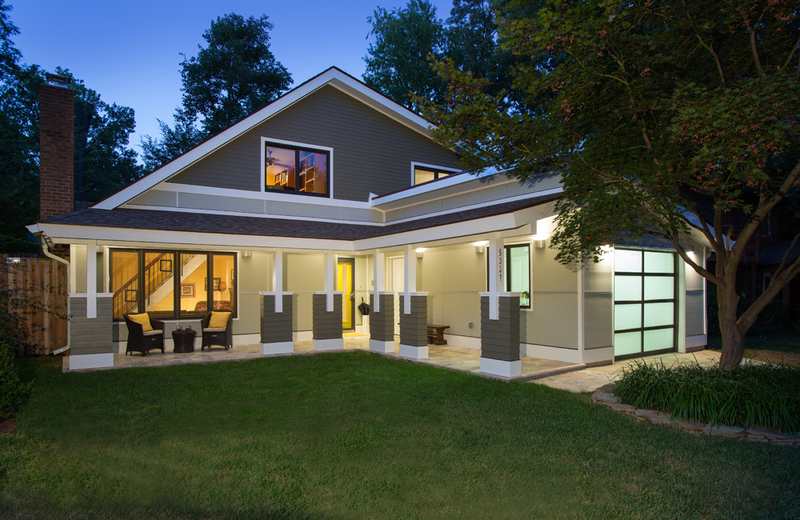 This beautiful home was named a Grand Prize Capital CotY (Contractor of the Year) award winner in 2015 by the Metro DC Chapter of the National Association of the Remodeling Industry for the category of Exterior Residential Remodeling over $200,000. It was also featured by HOME & DESIGN, the premier magazine of architecture and fine interiors for the DC, Maryland and Virginia region in their H&D Sourcebook of ideas and resources for homeowners and professionals. Check out our Before & After Photo Gallery and all our home remodeling photos to get your creative juices flowing. Then contact us to talk about the dramatic changes and home improvements we can accomplish for any part of your home – inside or outside! • For more inspiration, sign up for our free monthly e-newsletter and receive our “5 Tips For a Successful Home Remodel” how-to guide today.